The official day of summer was here few weeks ago and we had few days with temps in the 90's. It was a good reason for me to start experimenting with some summer treats that helped to quench the scorching heat. When sunny days are anticipated and plans are made the weather becomes unpredictable these days, it's getting record hot temperature at different parts of the nation and getting cooler for last few days where we live. I had been longing for high temperature to use the new Popsicle molds that I got early spring. Among the flavors my kids demanded for Popsicle experiments, the easy one was orange. To jazz up the regular orange flavor, I decided to experiment it with cream and it resulted in delicious creamsicles. 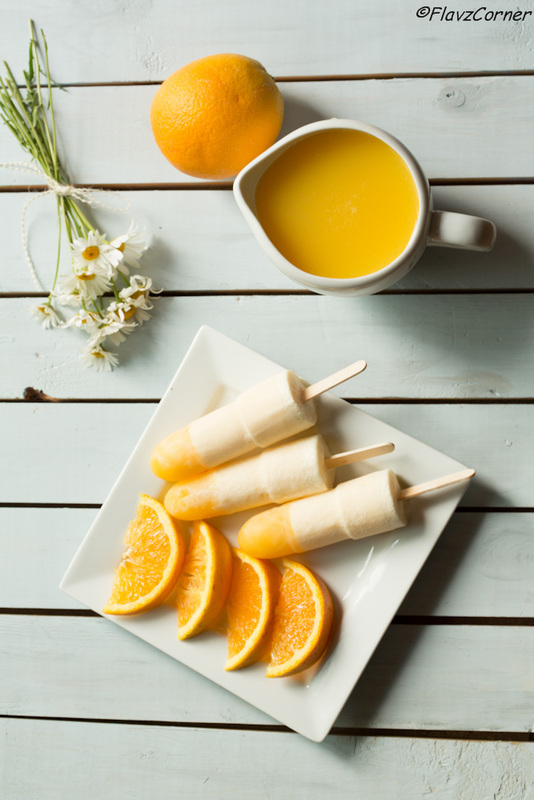 I was more than happy to make more of these treats for my kids when it finishes each time, as I knew that they are enjoying a healthy treat which is loaded with Vitamin C from the orange juice and the nutrition from dairy. To be honest, its not just a kids treat, we do enjoy them too. They are irresistible and full of citrus flavor which my family loves. I got raving comments from my family and the kids in my neighborhood who tasted these treats. 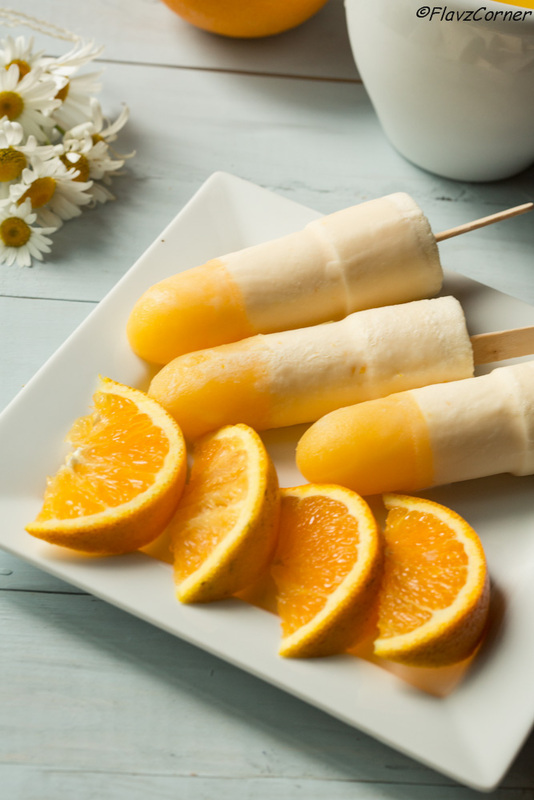 So if you don't have a Popsicle mold, don't hold yourself from buying a set, I ensure you that these creamsicles are the best summer treats you don't want to miss. Combine all the ingredients for the orange layer and pour the juice to fill 1/4 th of each Popsicle mold. Reserve the rest in the refrigerator for another batch. Freeze it for 30 minutes to 1 hr. Combine all the ingredients for the cream layer with a long spoon. Pour up to 3/4 th of the Popsicle mold with the cream mixture. Insert the Popsicle sticks and freeze up to 4 hrs. Store the rest of the cream mixture covered in the refrigerator till the first batch is ready and make rest of the popsicles. 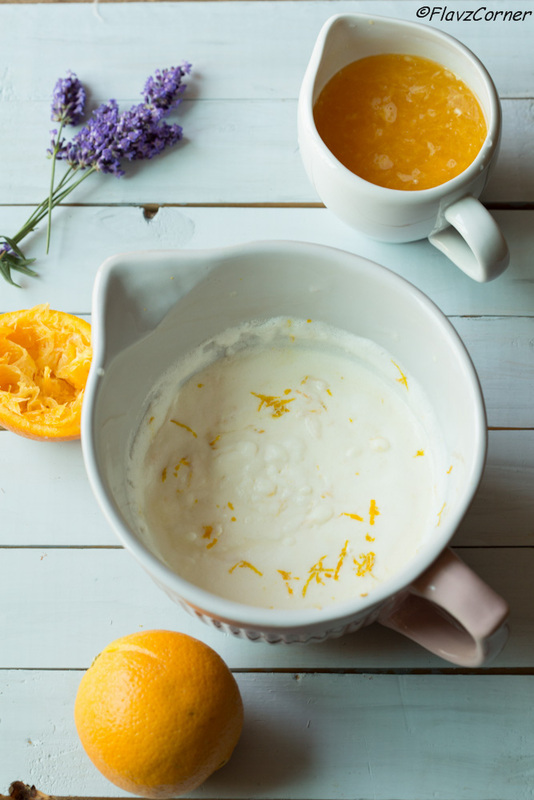 You can skip the orange layer completely and just use the cream mixture. I had made these 3 or 4 times now and my usual is just one layer of creamsicle. Store the Popsicles in the ziplock bag or glass container in the freezer till ready to be served. loos soo very tempting Shibi...and great clicks as usual..
Wow ..they r so tempting .. These look lovely! It's been years since I've had a creamsicle, and they were always one of my favorites when I was a youngster. Love the shape and look of yours - really nice. Thanks. How delicious! My daughter is crazy about oranges and we always have them at home. I have to try making frozen treats with oranges when I get back from my vacation! I love your beautiful photography. :) Thanks for stopping by my blog Shibi, and it's nice to meet you! Gorgeous and so refreshing!! Love homemade popsicles!! These are my fav Shibi and i love the shape of your popsicle moulds....I tried making some popsicles few weeks back and they wouldnt even come out of the moulds...darn! Loved this post! The orange color just pops out. Great collection of recipes you have here. Hi Shibi, this looks so yummy, refreshing, and pretty, I do love this dessert. I'm going to save it in my pinterest so I can try when summer gets here. Thank you for this.